Today I got a fish pedicure. It was awesome. I don’t really know what to say about the experience, you just had to be there. It’s the weirdest feeling in the whole world, but this has probably been one of my best days so far in China. There is something about having a hundred small fish sucking the dead skin off your toes that is exciting, and hilariously funny and a little gross at the same time. It was kind of my idea to do this, but I don’t know what I was thinking… I pretty much chickened out before the guys made me go through with it. Several of our friends had gone to this place earlier in the week and I wanted to take Benjamin while he is in town from Jinhua for the National Holiday. Somehow when I heard the term “fish pedicure” I was thinking the little water tubs with foot massager that they have in the U.S. When we walked by the place and I saw actual fish tanks I totally freaked. 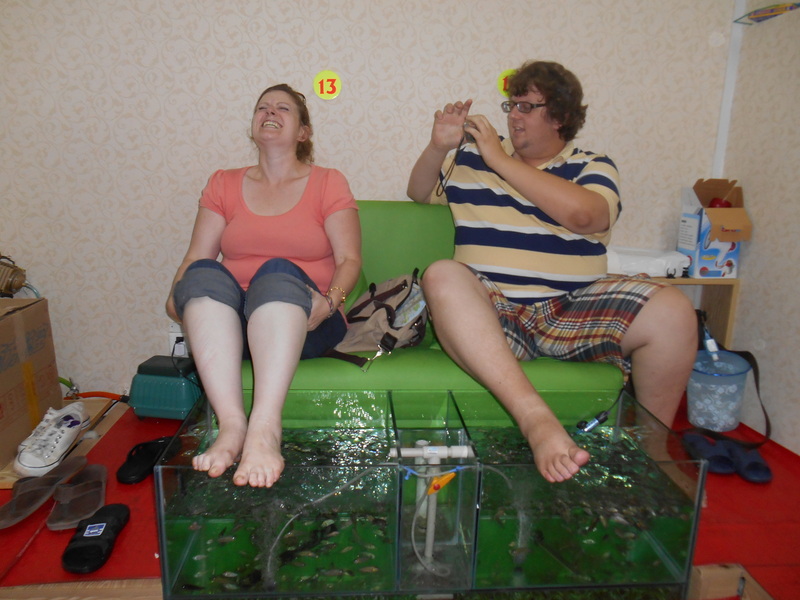 Jim and Benjamin jointly decided that I needed to be the first one to stick my feet into a tank of hungry fish. They come to the surface when they know it’s time to eat, (ie when your feet get close to the water). I have not laughed this hard in a really long time. The pictures tell the rest of the story. Thanks Benjamin, for making me go through with it when I really wanted to chicken out. I have to say that it does look like you had a great time! I have always said that if I had that done the fish would all explode from eating all the dead skin off my feet. 🙂 When I’ve gone swimming in the ocean if a fish touches me I totally freak out so I don’t think I would do as well as you. Thanks for sharing all of your stories and adventures, I look forward to reading them. Trust me, I totally freaked. It tickled and felt kind of gross knowing that there were fish swimming all over my feet. At the end, I looked at the bottom of the tank and found out where all that fish food goes when it goes out the other end of the fish. Yuck. I’ve heard about these and think it would be a blast! If you are ticklish though it would be hard. I think the lake thing is scarier because you can’t see the fish. It was totally cool. I told my friends that these would be the perfect pet. You never have to buy food for them, you just stick your feet in the tank every couple days and they are happy fish and you have smooth-as-a-baby-bottom feet. It’s a perfect relationship. sounds like a fun experience. How long does it take? Do they manicure your nails when the fish are finished? I received a lovely 40 minute session of fish-feeding time. You get used to it after a while and it’s that tingling feeling like when your foot has fallen asleep and starts to wake up again. Afterwards we went to Mr. Mai’s coffee shop. I’ll post about that soon for everyone to see. It’s a really cool hang out spot for Americans. Looks like you had a great time! I don’t think it’s something I would like to try, though! I don’t know if I want to try that! Lol! I saw a kiddie show with the kids where they did something like that and ended up sick later! Lol though they said it makes your feet feel as smooth as a baby’s tush. Anyway, it’s all about new experiences!! Keep it up!! Keep us informed!! Miss you!! I called Ms. Aline the other day, to wish her a happy birthday. I hope everything is going well with everyone back home. I miss you all too, sometimes more than others. I’m blessed this week to have Benjamin in town, he’s been making me get out of my comfort zone. We went to the bus stop and took the first random bus that showed up. I brought my map and we mapped out the bus route so I would know where it went next time. It was so much fun. I ended up finding some of the sights in town like a couple temples and the Yellow Crane Tower. It’s good for me to get out and about. I’m naturally kind of a coward. I would rather sit at home and watch movies than venture out with the possibility of getting lost in a strange country and not being able to find my way home. I am getting better though. I can now get myself home in a taxi. I know how to say the address in Chinese and how to say left and right so I can give the driver directions if necessary. Things are going really good here though. Several of the other teachers and myself are starting a group Study on Friday mornings as of this week, which should be a really positive thing. We are starting with videos based on the Case for Cr1st book. Tell the kids I miss them and send my love. Bahahahaha. Even Chinese fish love American food. By the way, my faith in humanity has been renewed today. Benjamin left his camera at the fish place, so we went by after our Sunday study today and as soon as he saw Benjamin (hard to miss the huge American guy), he said the chinese word for camera and brought it out to us. I was shocked and amazed at the honesty. I figured it would be long gone and he’d never get it back. Praise the L0rd. I am glad you met very honest and nice person. I am sure it is not easy to find the second guy who is as big as Benjamin, haha. god bless you and Benjamin, I wish you have great time at there. the thought of being in a tank of flesh eating fish is somewhat unappealing. I think it would tickle really bad. I would watch Benjamin do it though, he said he would try it. I will ask the manager to add extra big fish for him, so he can be very slim after he get out, haha. OMG I think I would have died! I hate it when they scrub my feet with a pumice stone during a pedicure. I couldn’t image a bunch of fish biting the dead skin off my feet. I am sooo ticklish! HAHA! When you put “fish pedicure” in an earlier post, I just thought it was a typo. But you were correct!!! The pictures tell it all!!! And again, I will say brave! But I think I might have done THIS with you…if you would have went first! I’m discovering that life is more about the memories and people you spend it with and less about the “stuff” you accumulate along the way. I have had so many cool experiences, I just hope I don’t drive everyone crazy with my “When I was in China…” stories when I get home.